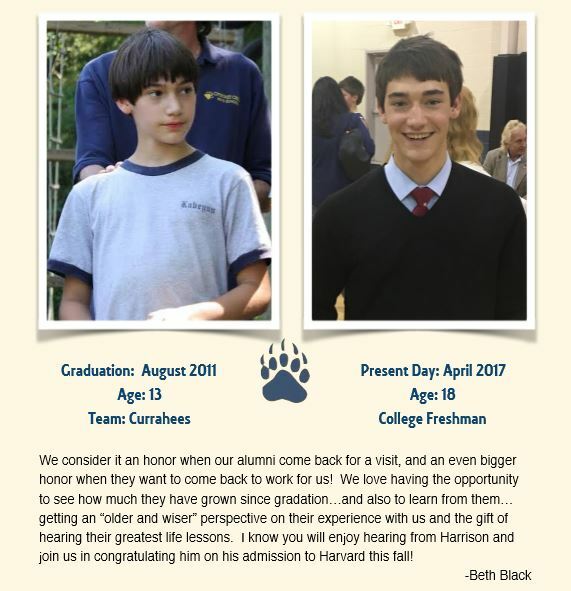 Tracking Our Bears: Harrison M.
I remember Elliott when he arrived at Cherokee Creek Boys School. He was a little guy with a full head of curly red hair. 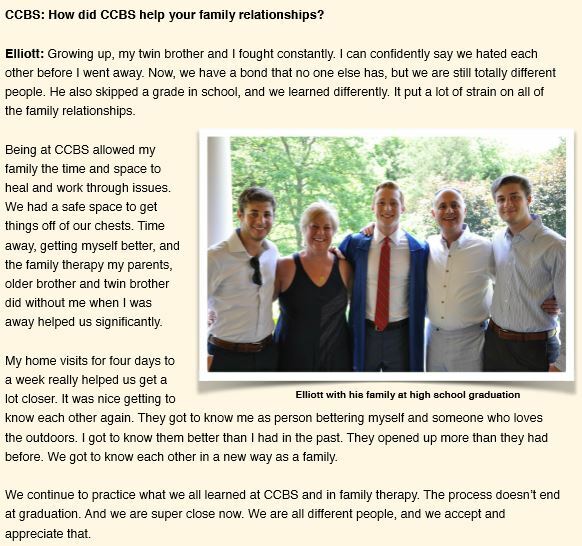 After that ﬁrst month of resistance, Elliott became one of the favorites on campus with a wide group of friends. 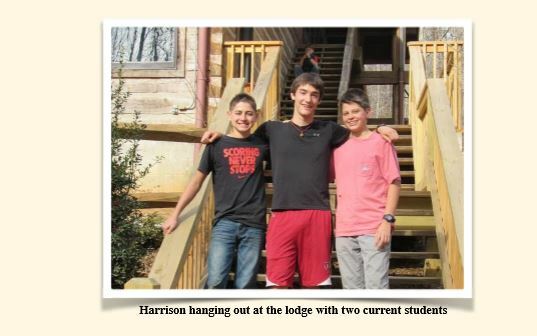 When our boys and families leave Cherokee Creek Boys School we often ask ourselves how they are doing. 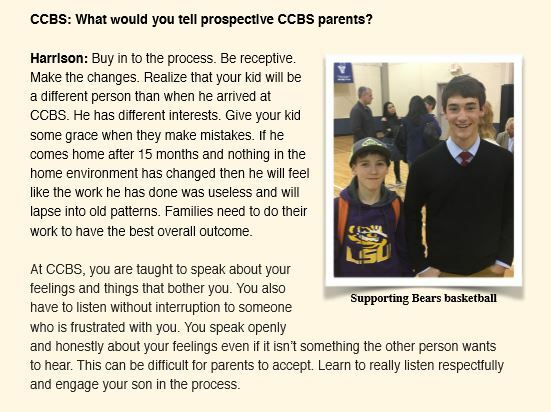 At last, we are able to go on a “bear hunt” and reconnect with CCBS alumni to discover what is real and true about their post-CCBS journey. 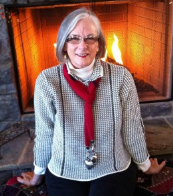 We are excited to share with you these stories in a new series featuring our former students. 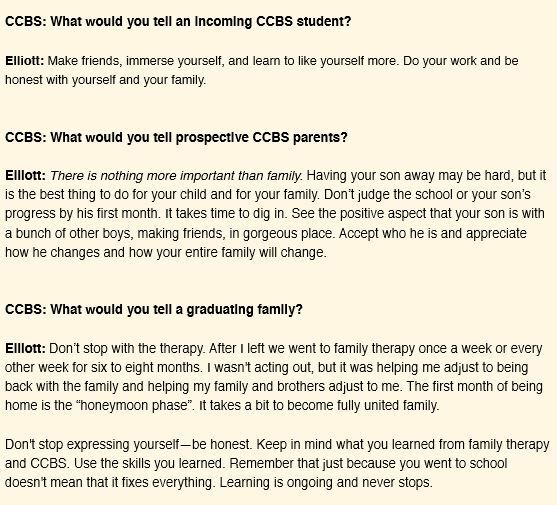 Our ﬁrst story is from Wes B. who returned to CCBS as our ﬁrst student intern in our Language Arts class. 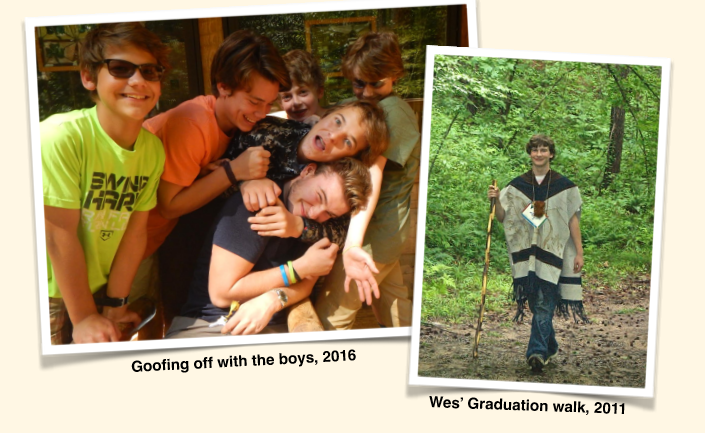 We couldn’t be more proud of Wes and his accomplishments. We know you will enjoy reading his story. We’d love to hear from you! 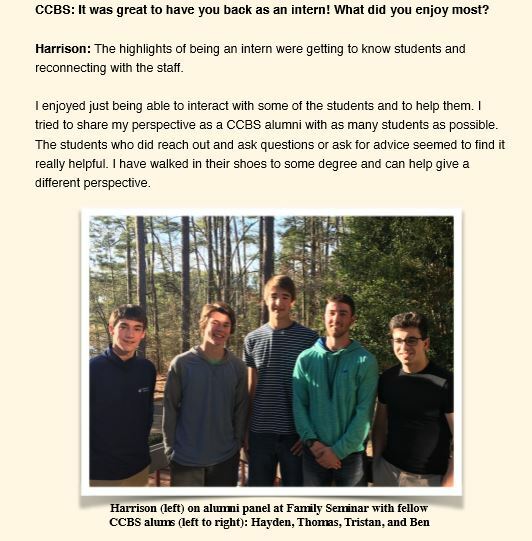 If you would like to share your story with our CCBS family, please contact Sarah Walsh, Alumni Relations, at swalsh@cherokeecreek.net. P.S. 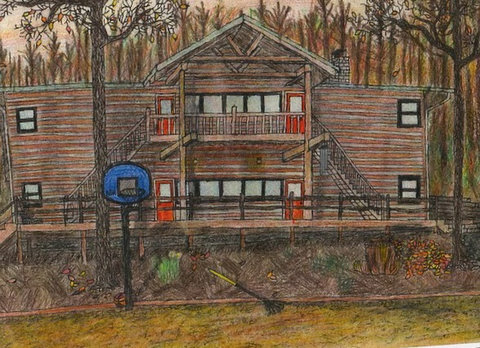 CCBS Alumni Weekend is May 4 & 5, 2017, and a CCBS Alumni Student Campout/Trek is set for June 22-24 on our new property. Mark your calendars! You’ll be hearing more about all our planned activities in the coming months! Welcome to the Fire Keepers Circle. 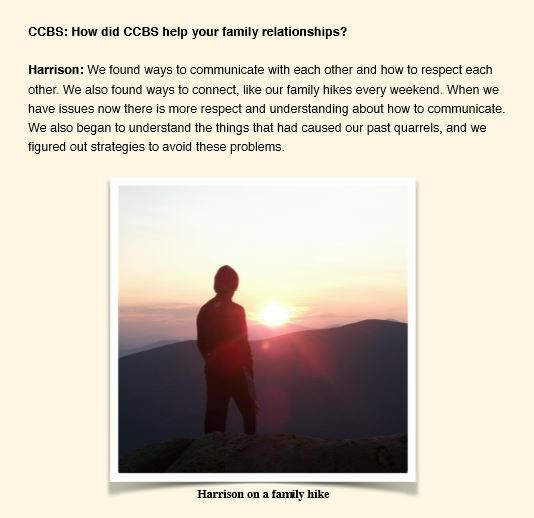 This the first issue of a new forum of communication oriented to alumni students and families. For more information about the Fire Keepers Circle, follow the “About” link above. But first, read on. We hope you will subscribe to receive future posts expected to number between 8 and 10 a year. “As we were driving through the windy street in East Ramadi, 7.62 AK fire started coming at us from our 11 o’clock. I immediately stepped on the gas, and having no where else to go, went straight into the fire… We continued along, and I remember seeing a black milk crate looking thing that was flipped over and looked at it as I passed it. Then I rememeber a flash – and that was it. The IED had blown both my driver door and the passenger door behind me completely off. Long story short, the Humvee flipped over on its top. One of my buddies, Justin, was in an armored vehicle and saw us get hit. As soon as we flipped, he ordered his driver to pull along side of us to shield us from the gunfire, putting his own vehicle at risk of being hit by an RPG or 7.62 rounds. I rememebr waking up and seeing Justin and his team running towards us. More AK fire erupted and it turned into complete chaos. Justin and two guys ran out and had another one give them covering fire. I remember seeing them run at us and slide on the ground next to my roof. My buddy Justin grabbed me by my IBE (bullet proof vest) and dragged me 15 feet, where he threw me into the back of the MRAP and ran back to help with the other 4 guys. I later found out that Justin was hit in the foot during this, ripping off half of his little toe. Luckily there were only 2 of us wounded during all of this. I had pieces of shrapnel and peanut sized rock lodged in my leg. 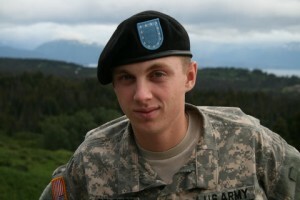 We were both treated by the combat medic and sent to Landstuhl Regional Medical Center in Germany to recover. We are both fully recovered and back in the United States now. 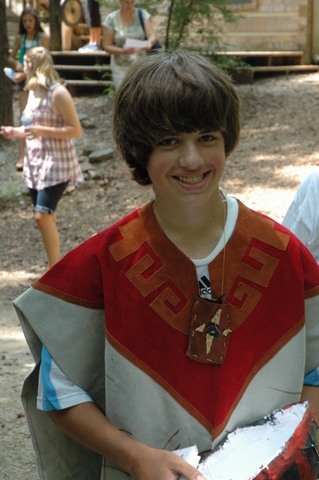 I reflect often on my time at Cherokee Creek and the lessons I learned. The biggest lesson that helped me in my time overseas is knowing the importance of teamwork. A mission cannot be completed without teamwork. Everyone has their specific job they need to do, and everyone does it. Another helpful lesson I learned is the importance of staying calm when I am upset and during stressful situations. Yes, everyday life can be stressful, but it cannot prepare you for hearing the snap of a round going over your head. While overseas, I would do a trick that my therapist taught me. 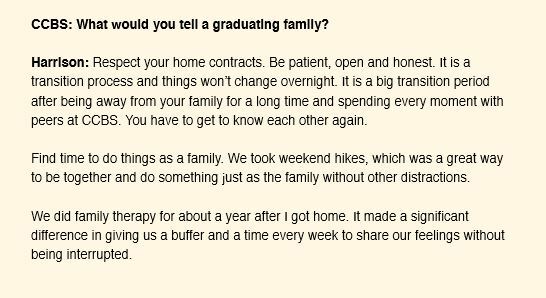 I would take a deep breath, and think of my family and it helped me to stay calm and focussed. Thank you, Nate for your courage and your insight. Indeed, our past mistakes do not mean we are a bad person…we show our strength when we learn from those past choices and learn to make better choices. 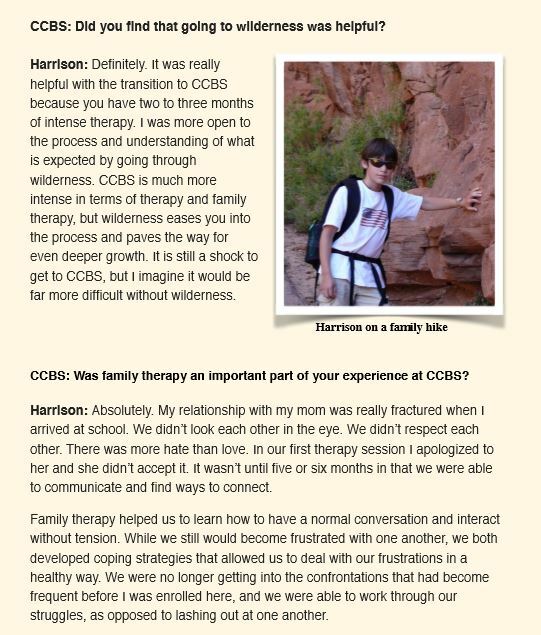 We are so glad to know that your CCBS experience has stayed with you and that you use the tools in your current life. 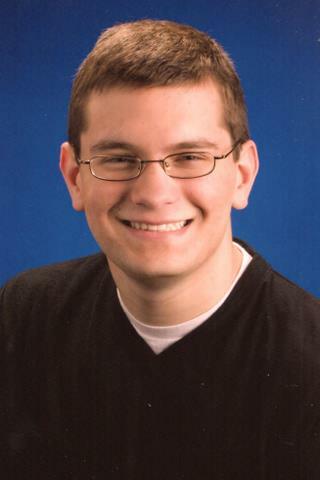 Wilson (’08) is a high-school senior in Atlanta, GA where he is taking AP Calculus, AP Physics and Engineering. Wilson hopes to attend Georgia Tech or another school with a top-notch mechanical engineering program next fall. Wilson and his family went rafting on the Ocoee River this summer and just celebrated Wilson’s 17th birthday zip-lining in Lula, Georgia. 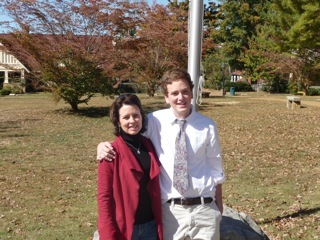 Nick (’09) finished his freshman year at St. Andrews – Sewanee Academy last spring as an Honor Student, making Honor Roll 5 of the 6 grading periods. He then had a very busy summer, working, spending a month at camp, family beach vacation, a trip to the Rock n Roll Hall of Fame and Cedar Point Park, doing every roller coaster there! He is back at SAS participating in Mountain Biking, the Outing club ( rock climbing, hiking, caving etc. ), soccer and trying to master sophomore academics. 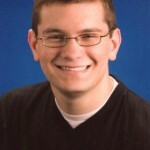 Seth (’10) is back in Texas and doing great as a high school freshman at DATA (Design and Technology Institute). 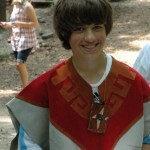 Seth is excelling in his challenging and hands-on classes: trigonometry, Photoshop, physics and computer programs. 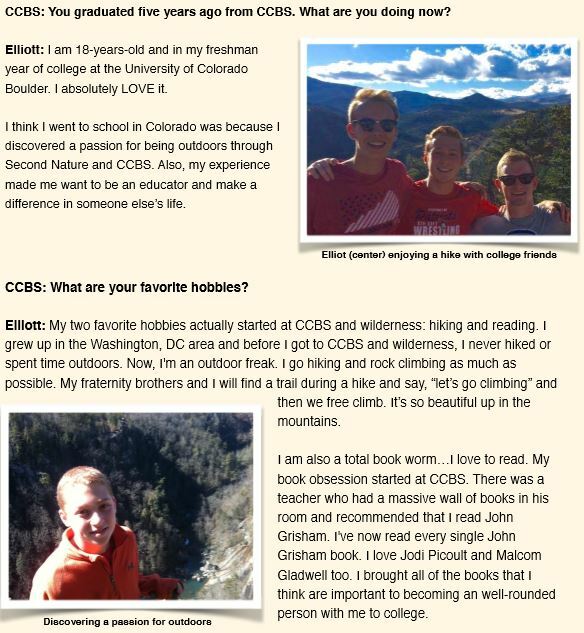 This summer, Seth and his father went rafting throught he Rio Grande Gorge in New Mexico. They covered 50 miles in 3 days. They enjoyed their trip so much, they are planning to go again next summer. 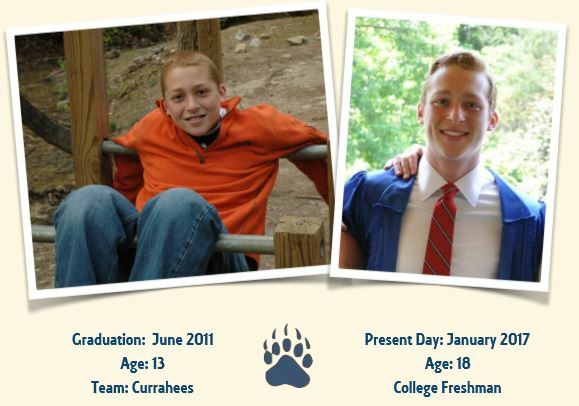 Daniel (’10) spent much of his summer practicing soccer with dedication. 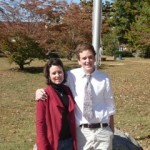 As a result, Daniel was the only freshman on the varsity soccer team at Blue Ridge Academy! 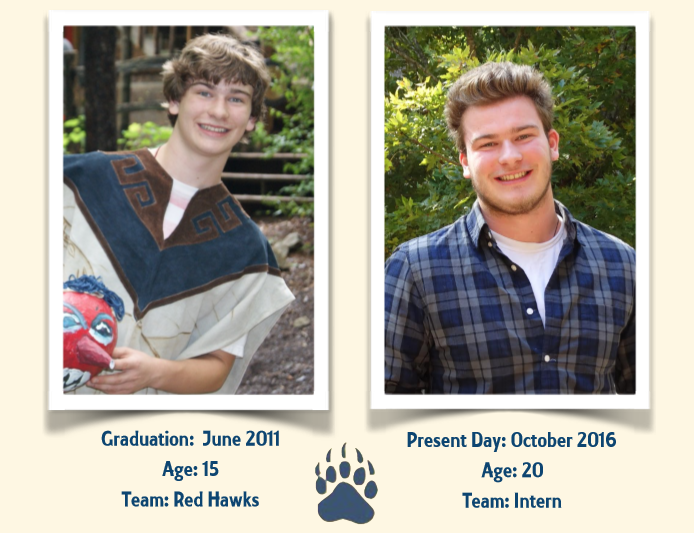 The team has a great mix of international students and Daniel has made many, many friends! 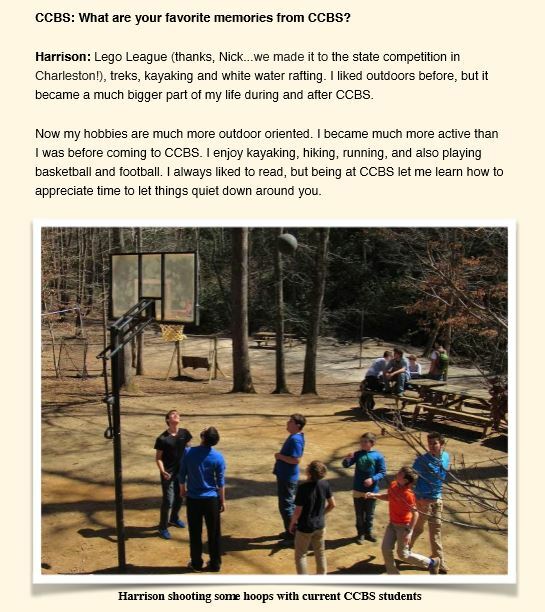 Harry (’10) is doing great in North Carolina. Harry created a wonderful drawing of our lodge and gave permission to use it on a greeting card. 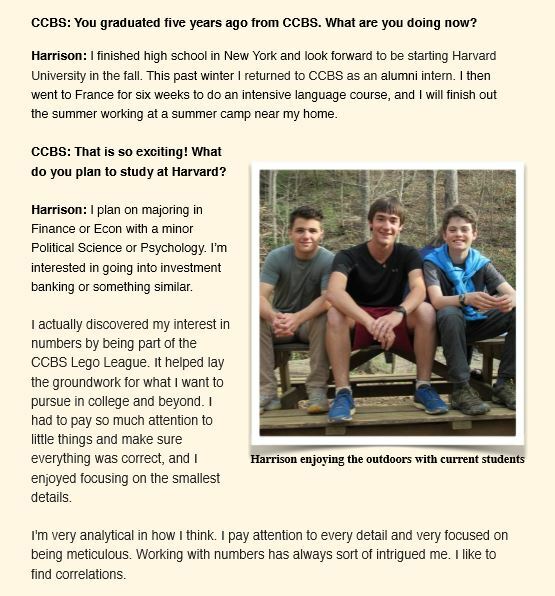 Congratulations to Harry for being our first published CCBS alumni! Thanks, again, Harry! We would love to hear from you and share your news!! 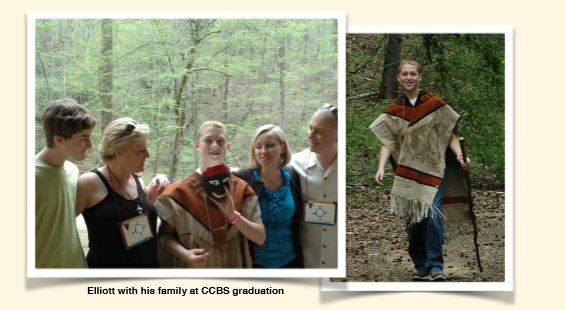 To submit alumni updates, please post a comment below or email them to bvenable@cherokeecreek.net. © 2016 | Created by Jay Hafling.